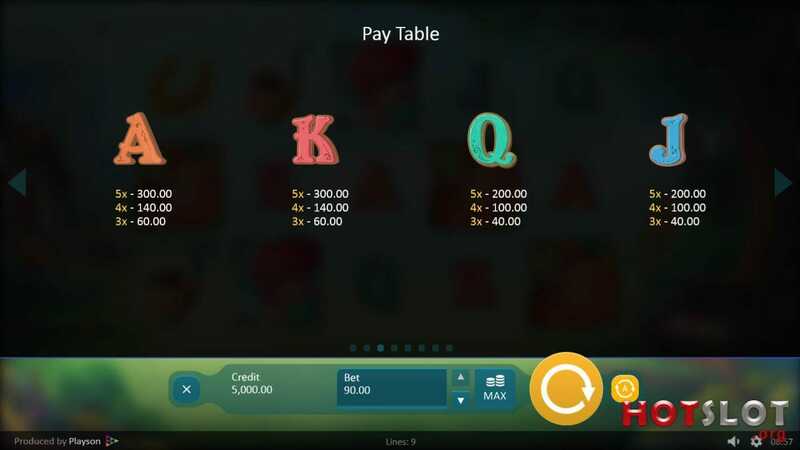 Here's a superb new online slots game from Playson which you can play. Get lost in the enchanted forest where dwells magical leprechauns and enthralling pixies. Cheerful pipe backing music and pastel coloured graphics make for a pleasant and immersive experience that will transport you to the Irish woodlands. What better way to celebrate St Patrick’s Day than with a pint of Guinness and a spin of this slot machine game? The idyllic setting will allow you to escape from your everyday stresses and bores. Admire the sunlight stream into the top left corner of the screen, be hypnotised by the gentle rocking of the leprechaun as he snoozes in his chair, and lust after the shimmering jewels tucked away in the treasure chest. As you spin the reels, a rainbow emerges in the background – with the lucky leprechaun on your side it’s only a matter of time till you find your way to the pot of gold! Playson have been operating for 10 years, based out of Malta, and in that time they have already produced over 40 high quality popular slots. They specialise in imaginative themes with cheeky leading characters and bright colours. 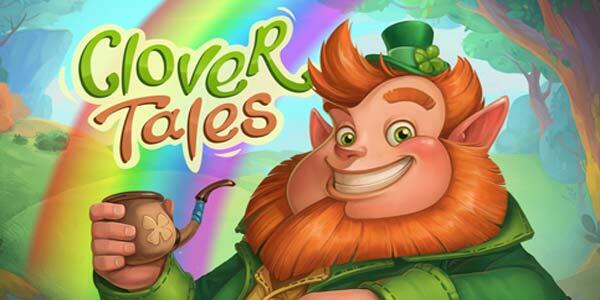 If you enjoy the playful cartoon quality of Clover Tales, you will also enjoy Bumper Crop and Aquarium, two other slots by Playcon. This is a 5 reel game with 9 fixed paylines. However you have considerable choice over how much you bet on each line, meaning you have a bid range from 0.27 to 90.00 per spin. You can also set the autoplay function to take 100 spins at a time. Rainbow Line – Every time you take a spin, one of the lines will become the rainbow line. This means that if certain symbols land on it you will be able to access bonus features. Landing either a pixie or the leprechaun on the rainbow line will trigger 5 free spins, and between 1 to 5 extra wilds on the reels! You might even secure yourself some wandering wilds – yes, that does mean wilds that wander across the screen! Unsurprisingly the pot of gold is the most treasured of all the symbols. It acts as an expanding wild and can substitute for all other symbols to help you get some winning combinations. Lining up 5 of them will also get you the maximum pay out of 2500 coins. The leprechaun and the pixie are the next best symbols – match 5 of them to win 1500 coins. 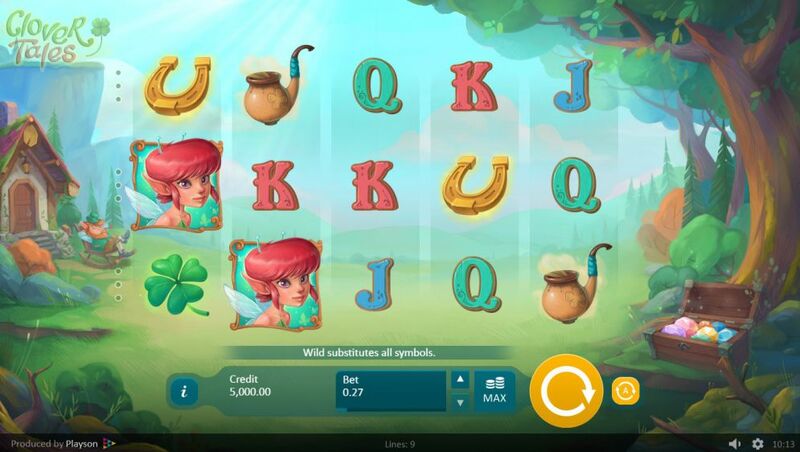 Generous payouts can also be won from the lucky horseshoe, the pipe, and the 4 leaf clover. Playcon have pulled out another winner with this game. The graphics are truly beautiful and the soothing pastel colours along with the melodious soundtrack make this the perfect form of escapism.